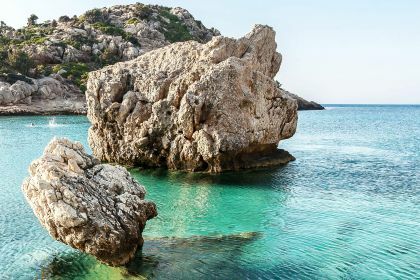 Ikaria, also known as Icaria, is best known as the island of longevity, or as the New York Times dubbed it, ‘the island where people forget to die’. This mythical island in the Aegean is known worldwide for its wonderful quality of life, which seems to prolong the lives of its inhabitants. Agios Kirikos, the capital and main port, sets the perfect scene for your authentic Greek island adventure. Walk the narrow cobbled streets, admiring the neoclassical buildings, overgrown courtyards and iconic slate roofs. And when you feel like a break, relax in the shade of mulberry trees in a cosy kafenia overlooking the marina, before sailing your yacht to the unforgettable Seychelles beach. Afianes Wines is a great spot to meet hospitable locals and revel in some scenic hillside views. Take a trip back in time and see how wine used to be made — not only does it offer a fascinating insight into traditional wine production, but you can sample some of the best wine in Greece here. Try the naturally sweet Tama, Begleri and Fokiano wines and you’ll understand why Afianes Wines have scooped up a number of European wine awards. If you are feeling a little more energetic, a climb up to the Theoktistis Monastery complex, artfully hidden away to deter unwelcome visits, is guaranteed to reward you well. Located high in the mountains next to the village of Pygi, it is an atmospheric haven of authentic stone houses and old churches. You’ll love the tranquility and lovely views. 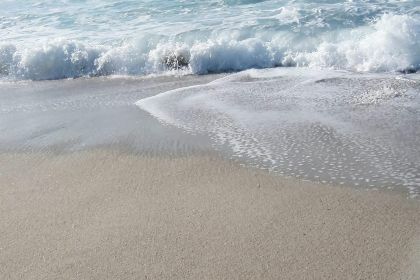 But it is for the curative properties of its waters that Ikaria is best known. One of the reasons given for the longevity gene, the many hot springs around Agios Kirykos are recognised for their radioactive water. At the Thermal Springs Spilaio in Therma, the public spring is conveniently located inside a cave on the beach, next to the marina, so it’s easy to access this natural marvel. Hot water mixes with seawater here to provide a free natural-spa experience. On your way back from the winery, why not visit the highly recommended Taverna Baido to sample some authentic local cuisine? The delectable Ikarian food is also believed to be one of the keys to the inhabitants’ renowned longevity. Also recommended are Thea’s Inn (five minutes down the road in Nas), Taverna Platanos, and Taverna Klimataria in Agios Kirykos (on the southeastern coast of the island). You’ll revel in the local organic meats, fruit and vegetables, as well as the array of appetising dishes using local products and fresh fish — all served with chilled Ikarian wine. 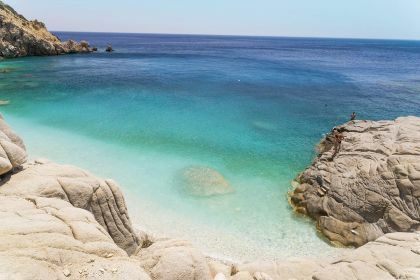 Insider tip While Seychelles is a drawcard, for good reason, you will be doing yourself a favour if you take in some of Ikaria’s many other pristine beaches. Head to Nas Beach for spectacular sunsets, Prioni for privacy, and to Fles for unforgettable snorkelling adventures. But why stop there? There are 13 to choose from. 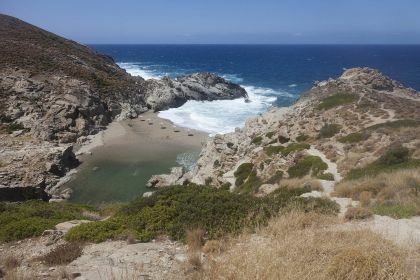 Life is definitely a beach on Ikaria.